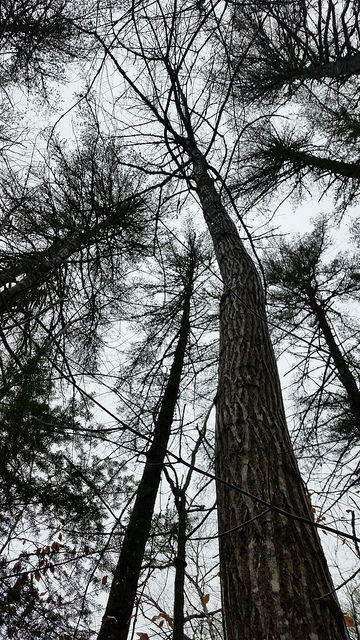 Looking up at the tallest American chestnut tree in North America in Lovell, Maine. A century ago American chestnut trees dominated the eastern woodlands from Georgia to Maine. Growing straight and tall they were prized for timber. Wildlife depended on the nuts they provided every year. People ate the chestnuts, too, scooping them up by the sackful every Fall. Then came an exotic blight accidentally introduced from Asia and the species was virtually wiped out. That's why scientists are excited by a recent find in western Maine, a record-breaking find that is raising their hopes for the future. The unusual discovery was made from the air. Dr. Brian Roth, a forest scientist with the University of Maine was surveying areas most likely to have habitat conditions favorable for chestnut trees and - voila! Flying over some woods in Lovell he saw a telltale sign. "In July, when nothing else is blooming, this tree will have a large amount of white flowers in its crown," says Roth. "The old timers talk about the hillsides in the Appalachian Mountains being covered in flowers as if it was snow and so we were able to key in on the particular weeks that these were blooming and did find this tree." This is not just any tree. This is an American chestnut tree worthy of the record books. 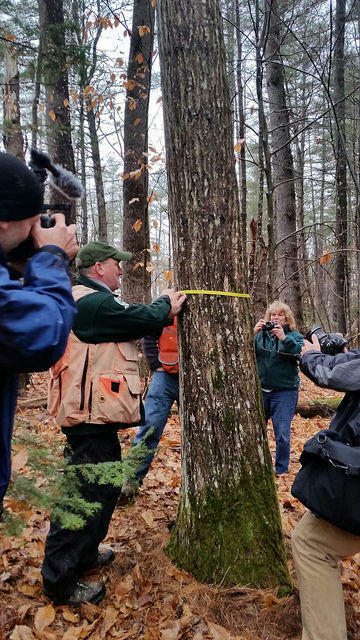 And this week, a gaggle of reporters, photographers and members of the American Chestnut Foundation, trudged out on a rainy December day to see Brian Duigan of the Maine Forest Service confirm some crucial measurements. Susan Sharon reports on the tallest American chestnut tree in North America. 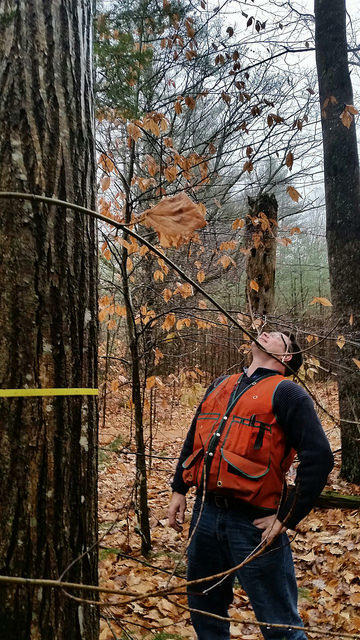 Shane Duigan of the Maine Forest Service measuring the girth of the tallest chestnut tree in North America in Lovell, Maine. "I have 16.1 inches," Duigan says. As girth goes, this chestnut tree is not so impressive. It's on the skinny side. And most people wouldn't pick it out as distinctive in a forest lineup. But when it comes to height, this American chestnut reigns supreme. "We think it's around one hundred years old," says Roth. "It's over 100 feet tall, which makes it the tallest tree that we know of in North America." One hundred and 15 feet tall to be precise. But beyond its size, Roth and members of the American Chestnut Foundation are interested in this hearty chestnut because of its ability to survive. Surrounded by a cluster of equally tall pine trees, this particular tree has escaped the fungus that has killed or stunted most of the rest of its species. "And so we're quite interested in these native trees, one for getting them into the population, our breeding program, as well as where do these trees grow?" Roth says. The North Carolina-based American Chestnut Foundation is devoted to restoration of the American chestnut to its historic range. And over the past three decades the non profit organization has attracted a loyal following, six thousand chestnut enthusiasts who help run a complex breeding program to transfer genes from the Asian chestnut, which is resistant to the fungus, to the American chestnut, which is not. Dr. Jared Westbrook is the American Chestnut Foundation's geneticist. "We have an orchard of trees, chestnut trees, in Meadowview, Virginia and so I'm working on developing strategies for breeding and selecting the most blight resistant trees," Westbrook says. University of Maine Forestry Professor Brian Roth staring up at the tallest American chestnut tree in North America. He says more than 60,000 chestnut trees have been planted so far. To help them out, the group is using a virus that infects the chestnut fungus and makes it weaker. But Westbrook says only 500 trees, the toughest and the best of the bunch, will ultimately be selected for reintroduction to the wild. "To do that is not as simple as inoculating the trees with the blight and picking the ones with the least amount of disease," Westbrook says. "There's still a lot of cryptic variation so you have to extract DNA, do DNA sequencing and figure out which ones are the strongest." If successful, recovery of the American chestnut through breeding and biotechnology could be a model for protecting other tree species from Dutch Elm disease, hemlock woolly adelgid and the emerald ash borer. Lisa Thomson president and CEO of the American Chestnut Foundation says there's a lot of hope riding on the little chestnut. "We see real promise of the future to bring the species back and how often can you bring a species almost on the brink of extinction which the chestnut was?" says Thompson. Thomson says she and her volunteers won't see a cathedral of chestnuts in the forest in their lifetimes but their grandchildren will and that's enough of a vision to keep them all going.